Bandel Church of Hooghly is one of the most visited & popular weekend destinations nearby Kolkata & Howrah metro cities of West Bengal. People having only one day in hand to tour from Kolkata / Howrah area; they should go to Bandel Church. Apart from Bandel Church, there are few more places to visit as well. Let check out all details of Bandel Church, Hooghly and how to go, where to stay, what to eat & when to go etc. • Significance of Bandel Church, Hooghly: - Let’s check out why Bandel Church of Hooghly is famous (popular) and attracts tourists. One of the oldest Christian Churches in West Bengal is Bandel Church of Hooghly [original name, Basilica of The Holy Rosary] is situated on west bank of River Ganga (Hooghly River). The Basilica of the Holy Rosary, popular as Bandel Church, was founded way back in 1599 by Portuguese as a memorial to the Portuguese settlement in West Bengal (India). 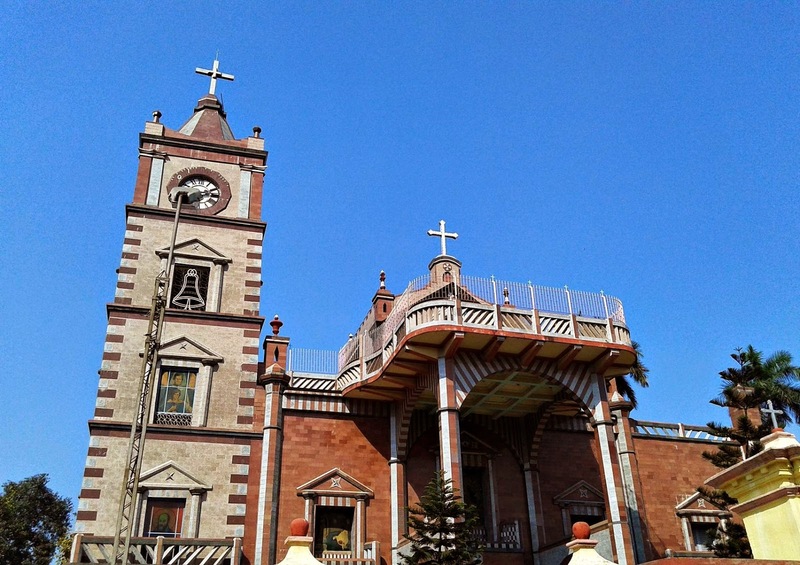 This Holy Christian Bandel Church is also a parish church, which is part of Roman Catholic Archdiocese of Kolkata (Calcutta). One of the heritage sites of Bengal i.e., Bandel Church is dedicated to Nossa Senhora do Rosario (our Lady of the Rosary). Inside the Bandel Church of Hooghly, you must see prayer room, our lady on voyage place, graveyards etc. • Bandel Church, Hooghly Opening & Closing Timings: - Bandel Basilica Church gate remains open from 8am to 5pm daily for the people. No Entry ticket / fee is required and this Holy Basilica Bandel Church is open for all to make prayer & offerings. • Best time to visit Bandel Church, Hooghly: - Entrance Gate of Bandel Basilica Church, Hooghly opens at 8am and closes at 5pm every day. So, any day of any month you can go there for prayer. But, it’s recommended to go there during Christmas / Xmas time in December, because Bandel Church complex was decorated excellently during Christmas. In winter season cool weather will let you seat & relax outside of Church for long time. • Nearby places to visit from Bandel Church, Hooghly: - There are few more historical heritage places situated near Bandel Church in Hooghly and they are Hooghly Imambara, Hangseswari Temple, Chandannagar Church & River Strand etc. On the day of visiting Bandel Church, you should visit Hooghly Imambara which is 15 minutes way from Bandel Church. To enjoy amazing beauty of nature, we suggest you to go to Hooghly Imambara from Bandel Church by boat. Boats are easily available at Bandel Church River Ganga bank for giving a trip round to Hooghly Imambara. • How to go to Bandel Church? Route map of Bandel Church, Hooghly: - Now, let’s discuss where is Bandel Church, Hooghly and which route to follow to go to Bandel Church. Bandel Basilica Church is situated in Hooghly district of West Bengal and only 35kms away from Kolkata. Nearest Railway station is Bandel [Howrah-Bandel-Bardhaman main line train route], from Bandel Railway station, you will get Auto & Rickshaw service to Bandel Church. If you are coming by car/bike, please follow G.T. Road & ask people which road to follow after reaching Bandel. • Accommodations near Bandel Church, Hooghly: - Now, let’s check out hotels, lodges, or any kind of rooms on rent are available or not near to Bandel Church. Hotels, lodges, guest houses are there nearby Bandel Basilica Church to stay at cheap price. But, no luxurious hotels are there. Mostly all sorts of foods like Chinese, Bengali foods, South Indian foods are also available on road-side restaurants. Nearest weekend destination from Kolkata, Bandel Basilica Church of Hooghly is one of the most prominent historical Churches in West Bengal as well as in India. Check video of Bandel Basilica Church of Hooghly. A visit to Bandel Church is must for all.